Blink and three years go by without updating. Life, new relationship, busy jobs, shifting priorities, forgetting to download photos from one's phone... It all adds up to not a lot of quilting for me. But I have made a couple, so for the sake of posterity, here's my update. 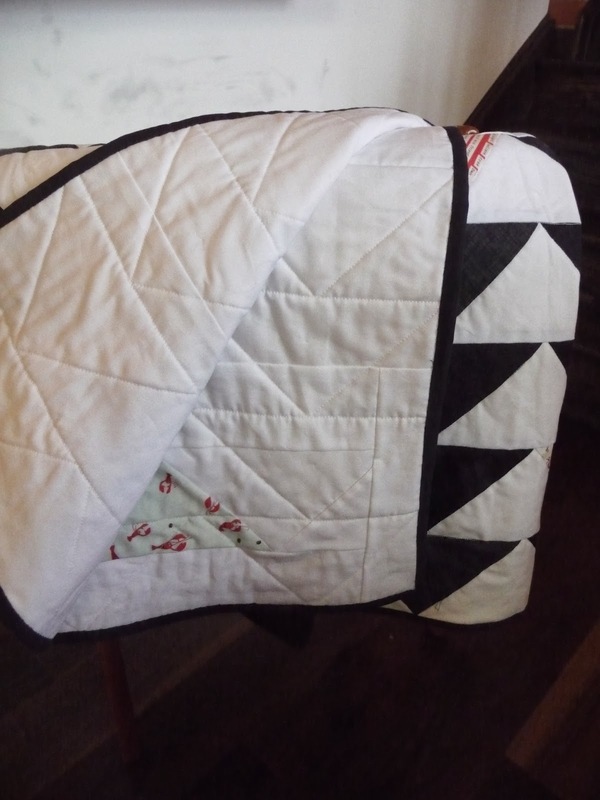 This is a lap-size quilt I made for my friend, Wendy, and her husband, Mike. Wendy loves to decorate using black and white, loves rocking out to Journey, Bon Jovi, etc. and loves eating lobster. 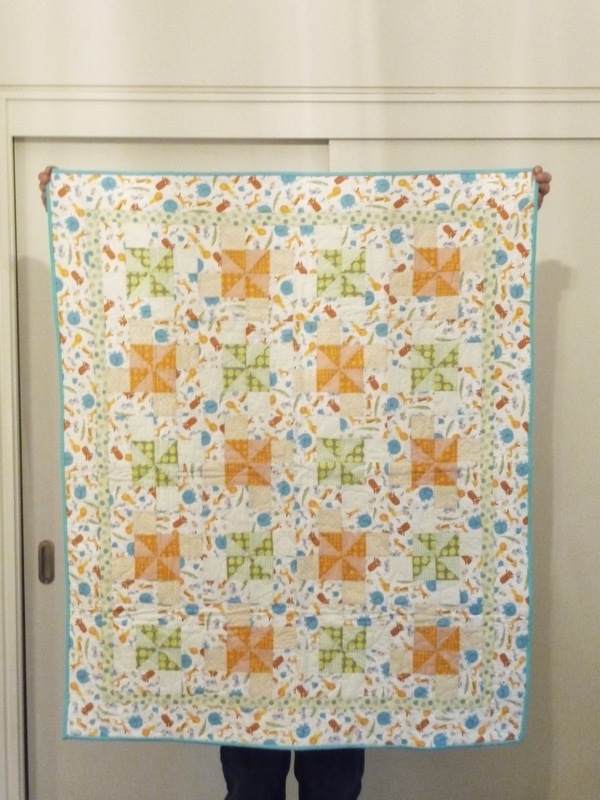 My husband and I have enjoyed many wonderful times with Wendy and Mike, so I was glad to bust through my stash to create a quilt I knew they would love. 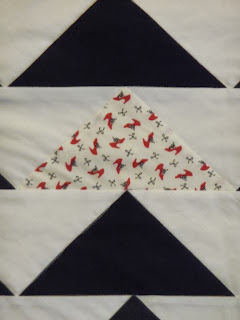 I used one of Denyse Schmidt's patterns (gah, I forget which one) and adore the simplicity of the triangles. 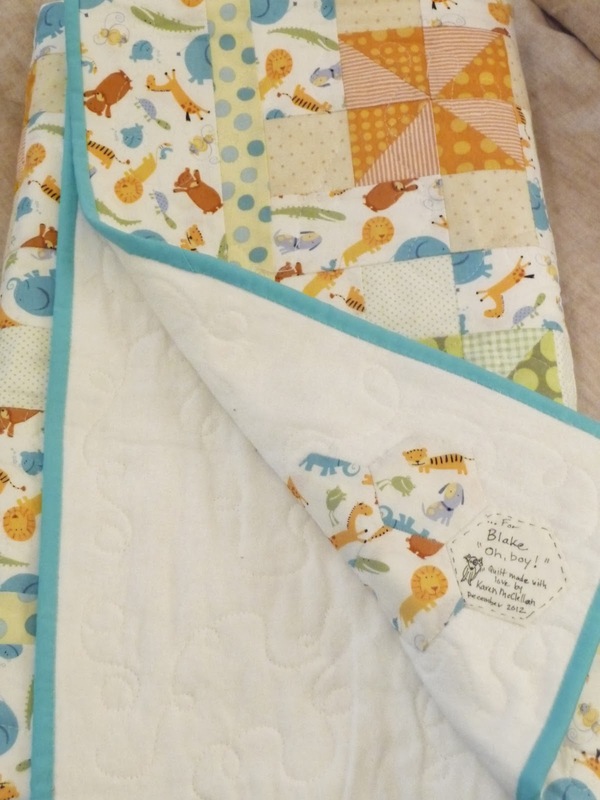 Next up is the baby quilt that I FINALLY finished. Just in time, too, for my friend Cindy's baby shower. 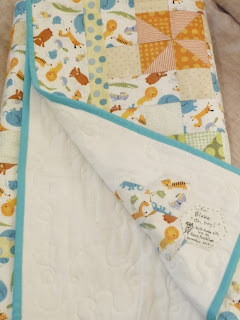 Cindy had a little boy in January and this quilt has a place of honour in the nursery. 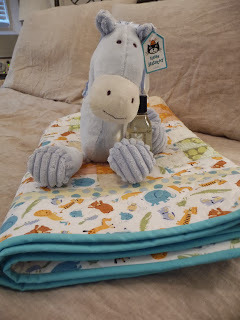 Being a blankie baby like Linus when I was a kid, I hope that Cindy's boy will get a lot of use out of the quilt. 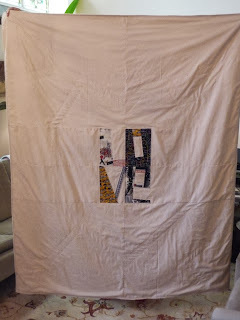 The last update is a quilt I made for a dear friend and his fiancee. K & D were married in April and didn't register anywhere, mainly because they're between coasts this year and don't know where they will set up permanent house. 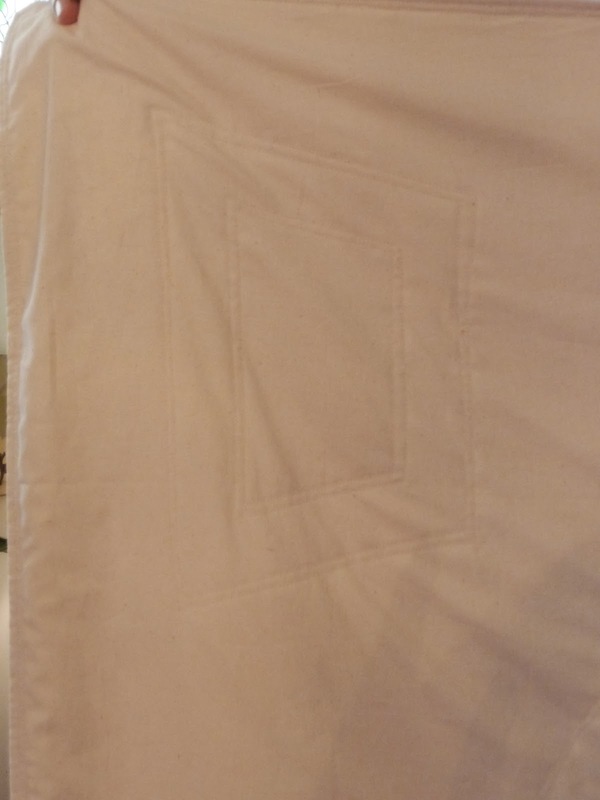 I thought a quilt would be the perfect gift. 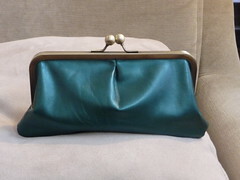 One problem: time was against me with a sudden job contract that limited the spare time I thought I'd have free to sew. I scaled down the ambitious vision I had to something very simple, yet I hope still meaningful. NYC is one of the groom's favourite cities. It's also where he was born, and where he proposed to his bride. 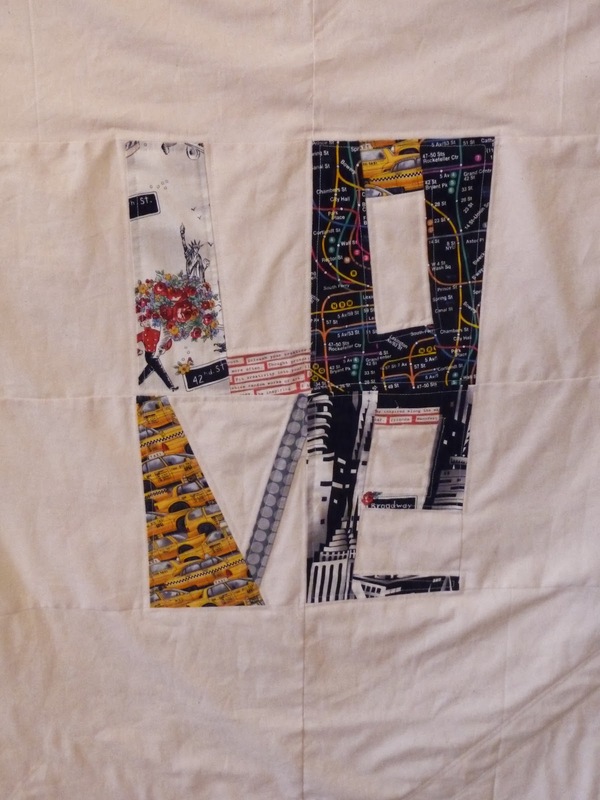 It also happens to be one of my favourite cities and on a trip a couple of years ago, I picked up some NYC themed fabric from City Quilts. 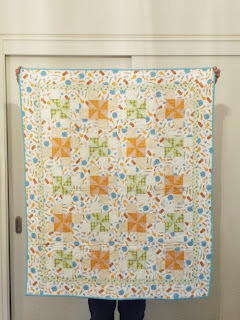 I'd been saving it and knew it would be perfect for this quilt! Without knowing what a couple or person's decor is like, making a quilt can be a real shot in the dark but thought using fabrics that relate to personal events would be good regardless of decor. Because time was at a premium - I only had two days from start to finish - I opted to keep the background VERY neutral. Then came another hiccup: my local fabric store, The Workroom, was sold out of batting. 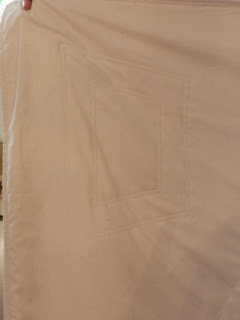 I brainstormed with Karyn, the owner, and decided to use a gorgeous heavy flannel as the backing. It turned out to be the perfect solution. The quilt is an over-size lap quilt (great for two people to snuggle under but smaller than a double) and the flannel backing, minus batting, cuts down on the bulkiness which is good if you want to pack it for a trip. Plus, it saved me an extra step which I didn't have time for anyway. I wanted to let the "LOVE" block stand out and decided to match the background with the flannel backing so that the quilt would look like a blanket. Carrying through on the neutral palette, I stuck with a cream thread. It was the safe choice and I was worried about the quilt looking too busy. In hindsight, if I did this over again, I would choose a thread (black, navy, or red) that stands out so that you can actually see the quilting. 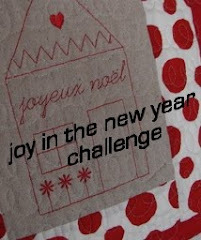 Quilting was a challenge - there was a LOT of blank canvas to use up! It's hard to pick out in the photos but I decided to quilt a big heart around the "LOVE" block with an arrow going through it. 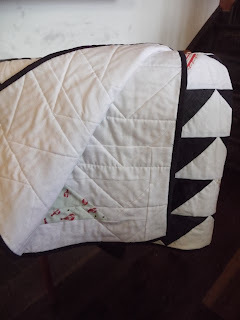 On the two remaining "blank" corners, I quilted the bride and groom's first initials, K for the bride and D for the groom. After a couple of washes, the quilt will puff up around the lines and the pattern will hopefully be more visible. All in all, I was very pleased with what I accomplished in a short amount of time. 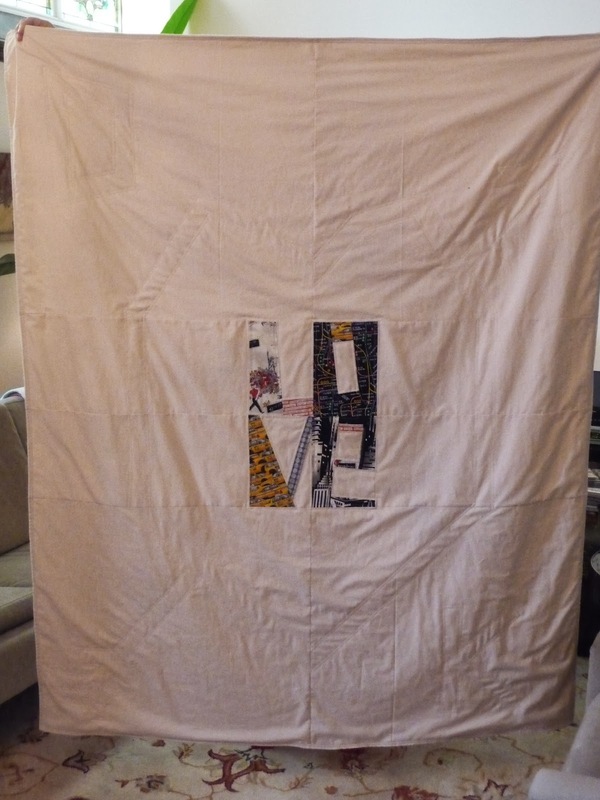 The quilt was a labour of love and one I plan to repeat someday as an anniversary gift for my husband. 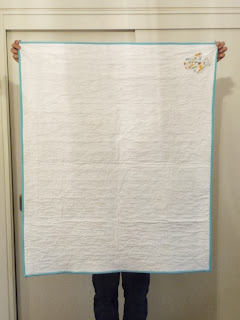 A baby quilt for my own little one who is on the way and due in December! See? 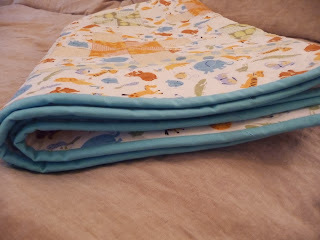 Aside from not quilting, I've been pretty busy! Here's a peek of what I've been working on this weekend. 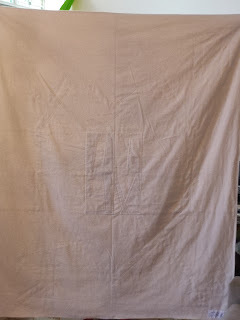 I finished the top last weekend, and spent yesterday basting and quilting (into the wee hours). This afternoon, I attached the binding to the front. Now all I have to do is sew it to the back, which I always enjoy doing by hand. It's a nice respite from the "sewing shoulder" I developed. All in all, it's been a good and productive sewing weekend. Oh boy! It only took a year to finish this top. Actually, it took about a month to finish the top which I made at The Workshop (taught by the amazing and inspiring Johanna of Seams Likely), and another 11 months to get around to adding the border. I'd like to take that as a sign I'm becoming a *real* quilter. That is, I'm steadily building up a pile of WIPs in varying states. 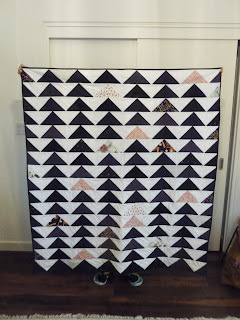 This past weekend, I put a push on finishing this top along with prepping two other quilts to send to R. Not only is she the mother of one of my best friends, R is a very accomplished and talented quilter. I am beyond lucky because as well as being an amazing teacher, she also has large quilt frame & sewing machine (not a long-arm, but one that is dedicated to quilting), and offered to quilt the tops at a family discount. While my Double Wedding Ring is riddled with mistakes and slightly off seams, it is my first (and maybe only) Double Wedding Ring and I know I can trust R to quilt something special. And also hopefully something that hides my mistakes. It feels great to have three quilts off my WIP pile! Guess that just means I have to start a few more projects. I bought some fabric. But who can blame me? Especially with the parity between the Canadian and U.S dollar? 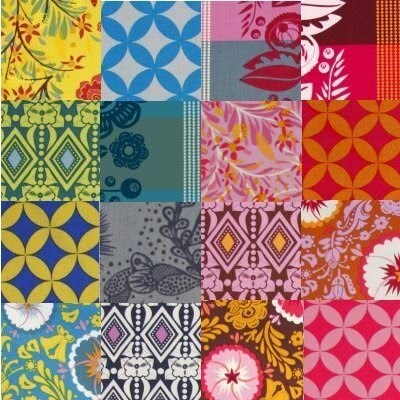 Anna Maria Horner's "Good Folks" fabrics are so rich in colour! I couldn't resist when I checked out her shop. I've admired this line for a while but my quilting tastes have finally caught up with the bold palette and I feel ready to go a little wild. Now waiting on baited breath for my bundle of fat quarters to arrive. It's official. I am addicted to English Paper Piecing. 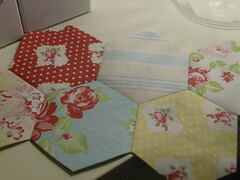 I LOVE making these hexagons! Hex Love seems to be in the air because I've run across a fair number of other quilt-blogs where hexagons are the current rage. 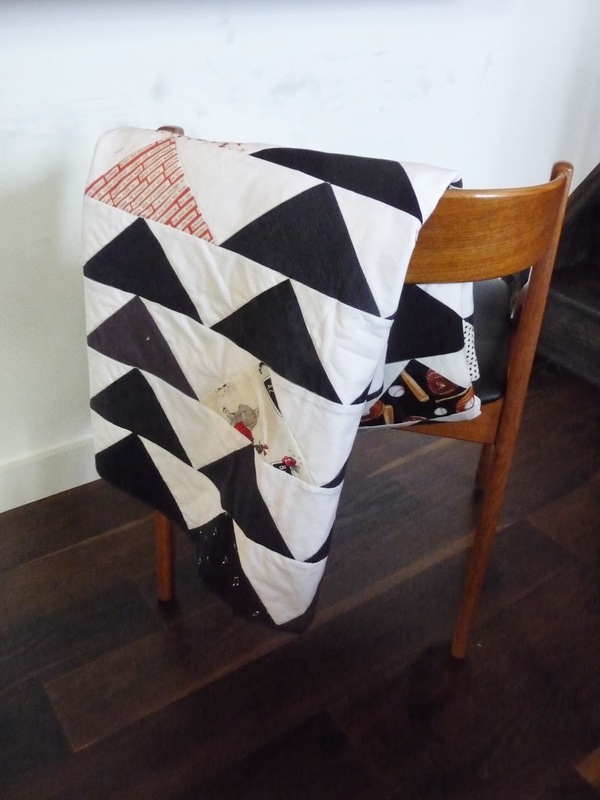 Perhaps it's because of how easy and versatile the hand-piecing can be? Especially with the warmer weather. Who wants to think about sitting inside quilting on a gorgeous, sunny day? Not me. My plan for these hexagons is pretty ambitious. 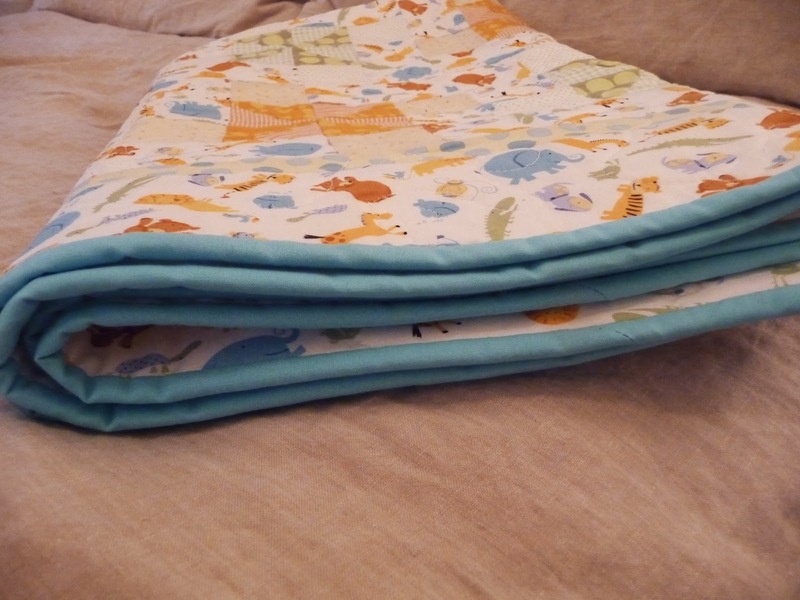 In my dream world, I want to make 270 of these 2" babies for a double-size quilt for my bedroom. 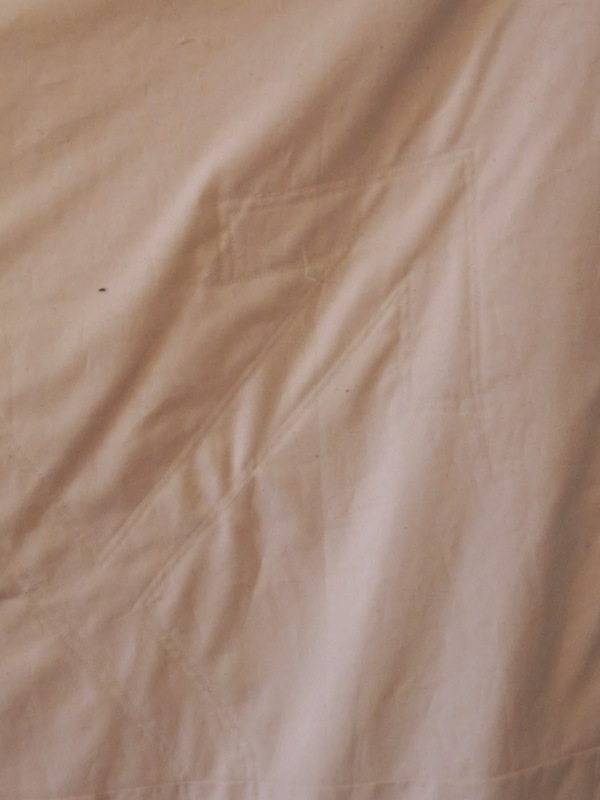 If I get on a roll, I'll more so I can have a true queen-size quilt. About twenty down and only 250 to go! 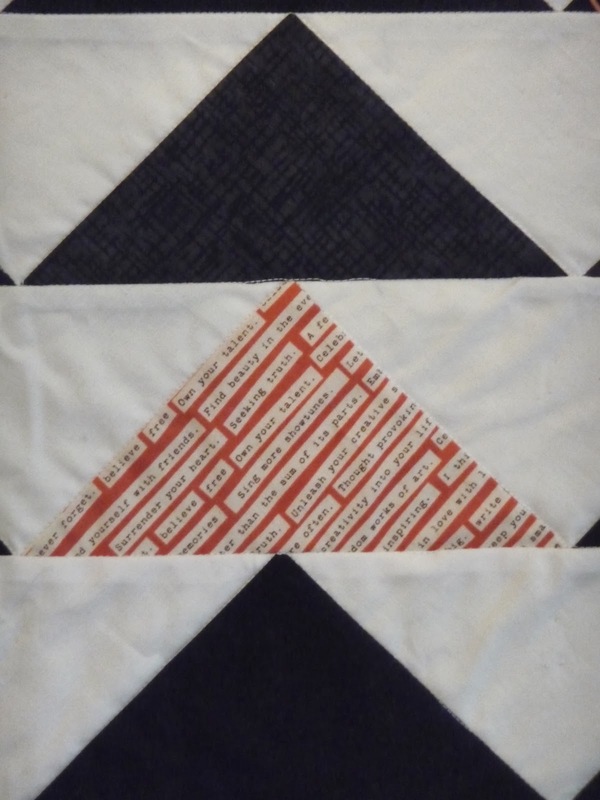 I am super psyched for the English Paper Piecing class I signed up for. Is it silly that I can't wait for tomorrow to arrive already?? 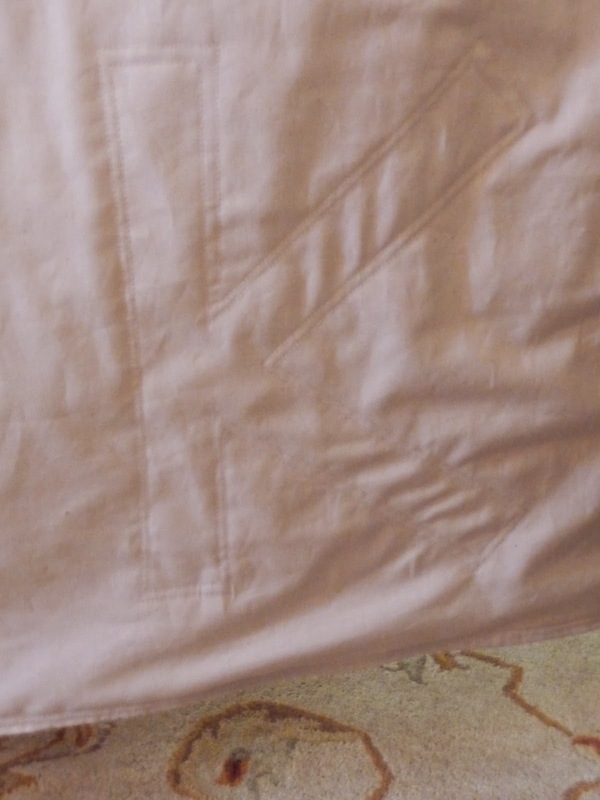 In preparation, I pulled some fabric from my stash. I've been zipping around some of my favorite blogs for inspiration, and naturally ended up taking a lot of cues from Ashley at Film In The Fridge. 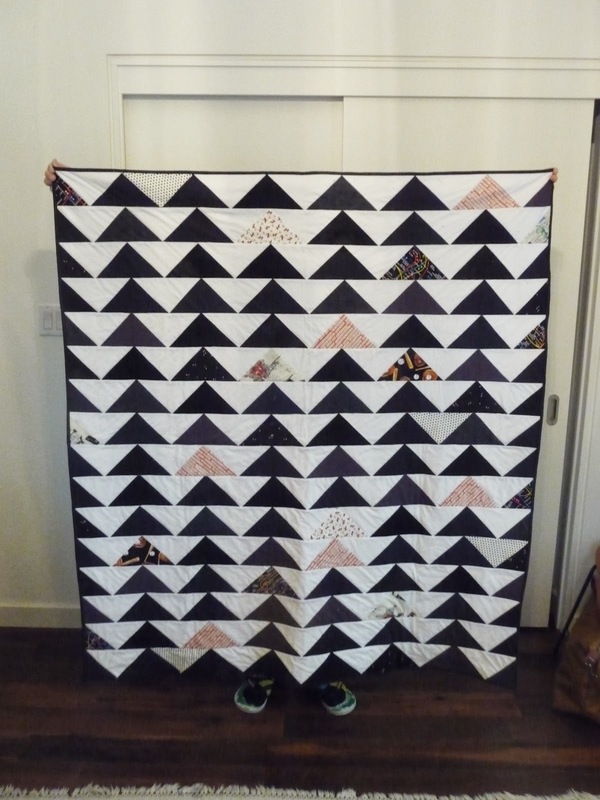 I love how fresh and modern her hexagon quilts look! 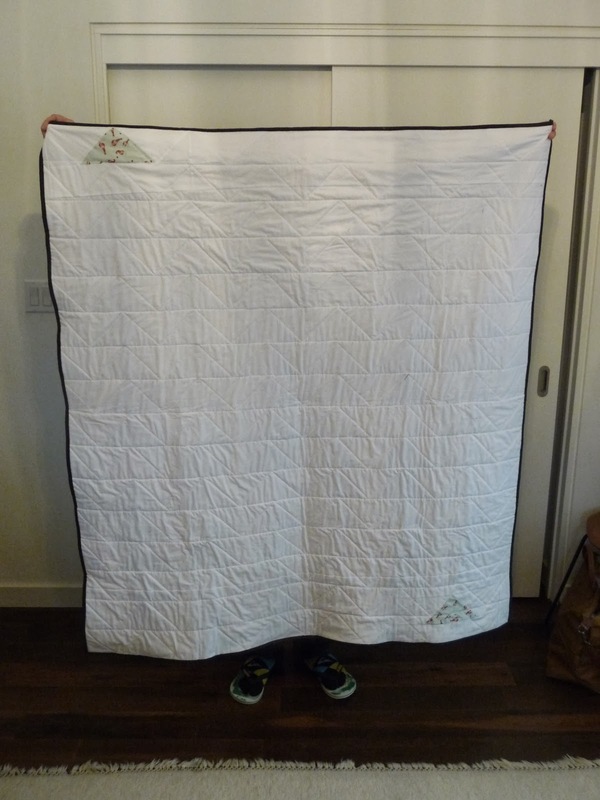 (Well, and all of her quilts in general!) In particular, I love how a scatter of hexagons takes away the pain (or obligation) of making a thousand hexagons the way I'd have to for the traditional Grandmother's Flower Garden quilt. Do any of you also find it helpful to evaluate if your fabrics work together by taking a photo beforehand? Taking a photo helps give my eye the distance or objectivity needed to see that in this instance, I'm missing a cool light blue or violet that's in more of a cornflower hue than the aqua prints I pulled. Sadly, I don't have that shade in my stash and this means only thing. I'm going to end up buying more fabric. Good for my collection, bad for my pocketbook. 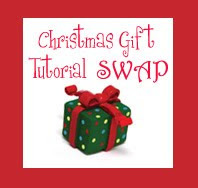 Note to self: Find a stash swap STAT!! !